I love infographics. I love infographics so much that I’ve written a blog about them. An infographic is short for ‘information graphic’ and is a visual representation of information data or knowledge. They are the perfect tool for presenting complex information quickly and clearly. How much information do you receive on your average day? For most of us it’s more that our brains can process. As we become increasingly connected through use of mobile and online technology our attention spans are becoming shorter as we try to process increasing amounts of information. As we flit from task pretending ‘multi-task’, the ability to filter information is becoming more and more important. So the task for anyone getting their message to stand out amongst all the background noise is becoming harder than ever. I think infographics are a good way to grab attention and they tend to be shared widely via digital media. This blog by Mick Dee provides some good examples of how infographics work and some tips for developing your own. So given what a great tool an infographic is for expressing complex issues in a compelling way and demonstrating impact, I am surprised that more charities are not using them. Infographics can showcase a charities expertise, demonstrate their view in a wider political and social environment or could be a way to thank donors or keep them up to date on progress. They provide visual clues on the cause and can bring a sense of fun where appropriate. 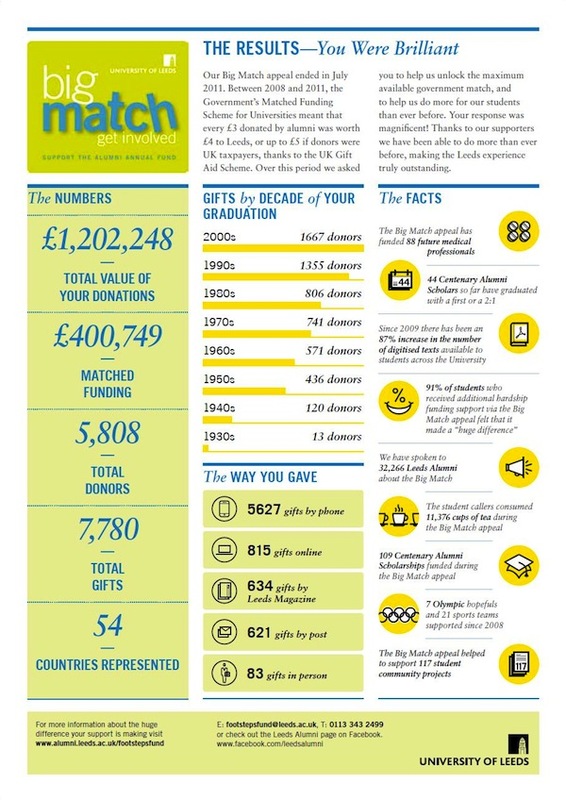 Leeds University’s Alumni & Development Team have presented the results of their matched giving campaign in infographic form as a thank you to the donors who gave. It will appear on the back cover of the next donor newsletter. Brilliant. The Bill and Melinda Gates Foundation have some interesting infographics, including an interactive one on it’s campaign to end malaria. Charity water and eNonprofit Benchmarks Survey are both making good use of infographics to communicate their messages. Click on the links on the images to see in more detail. So next time you have a message to get across to donors, supporters, volunteers, staff or the general public, bin the lengthy word document or email, and think if using an infographic will work harder in cutting through the background noise to enable you to get the results that you want. This entry was posted in birthday, creativity, fundraising, ideas, infographic, Innovation, Inspiration, marketing, relationships, social media, Uncategorized and tagged audience, benchmark, Bill and Melinda Gates Foundation, business, charity, charity:water, communication, community, connectedness, creativity, fundraising, Howard Lake, infographic, insight, Inspiration, Leeds alumni, malaria, mick dee, stories, success, uk fundraising, volunteers. Bookmark the permalink. Thanks, Lucy, for mentioning my growing collection of infographics. You’re right about the importance of filtering. Indeed, I see infographics as an element of curation, the skill and practice of filtering, interpreting and presenting your informed view on data. We’re all bombarded by data, and many of us produce piles of it. An infographic is one way of analysing that data, making it understandable within a context, and thereby helping your audience understand the issue better. Good point – it is about curation of relevant information. The digital curation course looks excellent. Really practical content too. I’d love to be able to ‘do’ some infographics. Perhaps I’ll add that to my list….. So what was the result of the Bridger Lake stand off? How did I miss that?! BRILLIANT Who wants to tweet compare infographic with me?